For those of you who don't know thankyou, they are a social enterprise who believe that we can end global poverty in this lifetime, together. The enterprise was started in 2008 in response to the World Water Crisis. Co-founder Daniel Flynn with the help of a group of friends in Melbourne turned an idea to launch a line of bottled water that would fund water projects overseas into a reality and the rest is history! thankyou now has over 40 products in 5000 outlets in Australia and the best thing is 100% of the profits fund safe water, food, hygiene and sanitation projects across the world. In August this year, thankyou launched their nappy and baby care range with 100% of the profits going to child and maternal health programs around the world to help and empower families in need. The thankyou baby care range is huge and we were happy to trial them all and have them around the house, such gorgeous designs! The range has a baby bath wash, baby bath milk, baby shampoo, baby lotion, baby ointment, baby nappy balm, mums and bubs massage oil and baby wipes. The best thing about these products - they are dermatologically tested, pH balanced and free from nasties like SLS, SLES, EDTA and parabens and help families overseas in need - two awesome reasons why we love them. I am glad the antibacterial grapefruit hand sanitiser was thrown in there too - great to disinfect after those crazy nappies. First up, the thankyou baby bath wash - soap free and no nasties! It has a light scent, leaves the little ones' skin nice and soft and the best thing of all and my little ones' favourite - makes lots of bubbles! I also like that it leaves the bath grime free too. 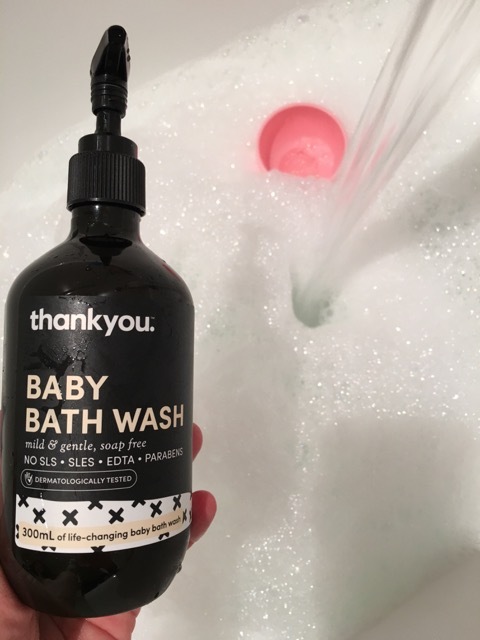 We also tried the thankyou baby bath milk, again a light fragrance and soft gentle cleanser but little Miss wasn't a fan because she didn't get bubbles. Little Mister and I did the rest of the testing and enjoyed it. We like the thankyou baby lotion, it's nice and light, non greasy, easy to apply and nice for those little patches on dry skin of bub's legs and behind the knees. I didn't realise it at first but the thankyou baby ointment and thankyou baby nappy balm work together to help reduce nappy rash. Little Mister doesn't often get nappy rash but at the time we were trying these products, I had been trying a new dessert for him - green kiwi fruit. Not a great idea of mine as green kiwi is very sour and acidic. I didn't think about it at the time as I had fed him yellow kiwi fruit in the past but green kiwi did not agree with him and poor thing had crazy nappy rash as a result. After applying the nappy balm for a day, I noticed some improvements. The nappy balm is non greasy, nice and thick to cover bub's bottom. After that I tried the baby ointment. The ointment creates a barrier to help prevent nappy rashes or dry skin patches, it's great to use before the balm to prevent nappy rash. It feels like petroleum jelly without the petrochemicals - very clever! Both products worked well which I was happy with. Next up, one of our favourite products from the whole range - the thankyou thick baby wipes which again contain no nasties - no soap, parabens, sulphates, alcohol or petrochemicals, are 98% made of natural elements and are fragrance free which is fantastic. My kids are messy so these wipes were put to good use! Little Miss has first child syndrome so always wants to wipe her hands after each bite to eat! These were great on little Mister's face after food and the fact that they are large and thick makes them fab on the bum as only a few wipes are required for the messy nappies. They don't feel strange if used on the face either which is great as some wipes freak me out a bit! We also tried the thankyou baby shampoo which was soap free, gentle with a subtle scent. The thankyou baby mums & bubs massage oil was really nice too, gentle non greasy and natural. Last but not least, we also tried the thankyou hand antibacterial grapefruit hand sanitiser, a mouthful to say but so good to use. Feels light, light scent and after a few pumps the delicious smell of grapefruit makes me hungry! Hard to pick a few favourites however we love the baby wipes, baby bath wash, baby lotion and baby nappy balm and ointment and will restock these soon from our nearest shop. We love thankyou's new baby care range! Not only does the range have no nasties and feels great on bub's skin and the best part 100% of the profits from the range go to child & maternal health programs to families in need. I tracked our impact by entering the tracker ID # from each product and they all support one child and maternal health program situated in Khotang in Nepal and will impact 5,000 people - amazing!! 'Right now, every 103 seconds a mother dies in pregnancy and childbirth, and globally 2.7 million babies don’t reach their first month of life because they don’t have access to basic health care' said Daniel Flynn from thankyou. Let's change that and with products starting from just $8.49 it's not hard to! This post is in no way sponsored. Products were provided however my opinions are my own. I like to endorse companies who give back to the community. I do not endorse products I do not test, do not like or endorse organisations I do not believe in. Checkout more product reviews here. Or if you live in Melbourne or Sydney, checkout our blog for ideas of what to do with the kids!